. :: Preview : Lock-On (English) ::. 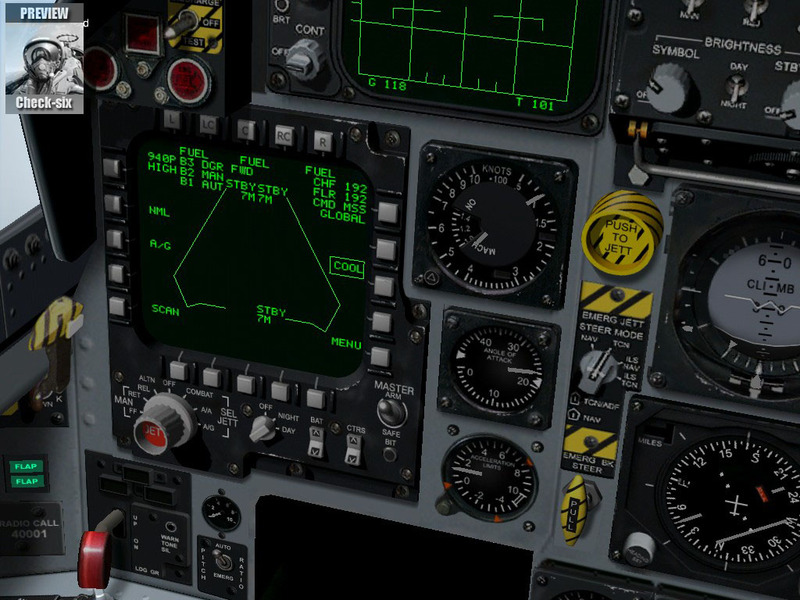 It is with some great emotion that Check Six is going to tell you about its first impressions on the most awaited modern jet sim. 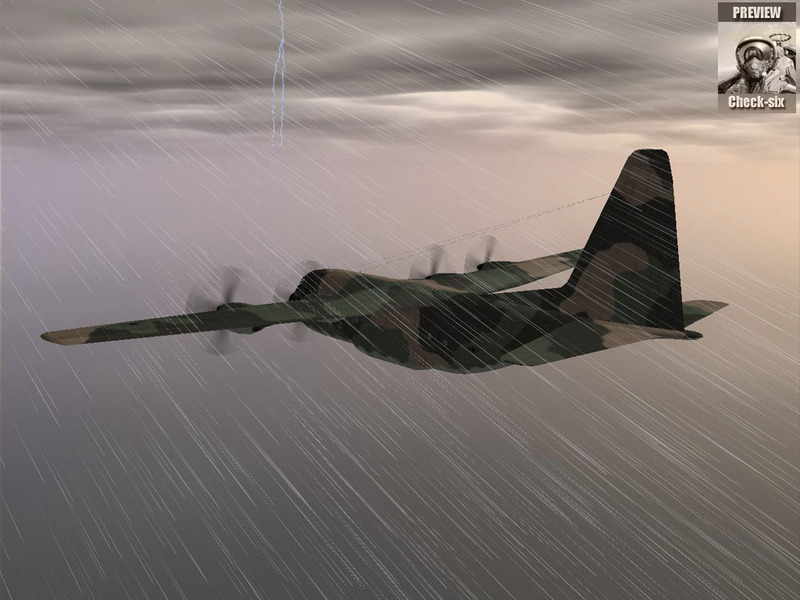 From delays to postponements, Lock On : Modern Air Combat (or Lock On : Air Combat Simulation for the european market) is playing hard-to-get. The Lomac developpers are working hard in order not to deceive, since they know how demanding flight simers can be. Thus, if Lomac is a long time coming, this is so that the Eagle Dynamics team can finish its simulator. But, as you may have understood, we are now in the final straight! F-15C, A-10 and the german MiG-29 (with its specific avionic) for the Western side. Needless to say that the project is particularly daring, and the obsatcles to overcome are numerous. Indeed, who may imagined this ten years ago? A russian Moscow based team modelling the wepaon systems of the F-15C and A-10 thanks the will of an american fan, edited by Ubisoft, a french multinational company ... a whole symbol : the Cold War is definately over. 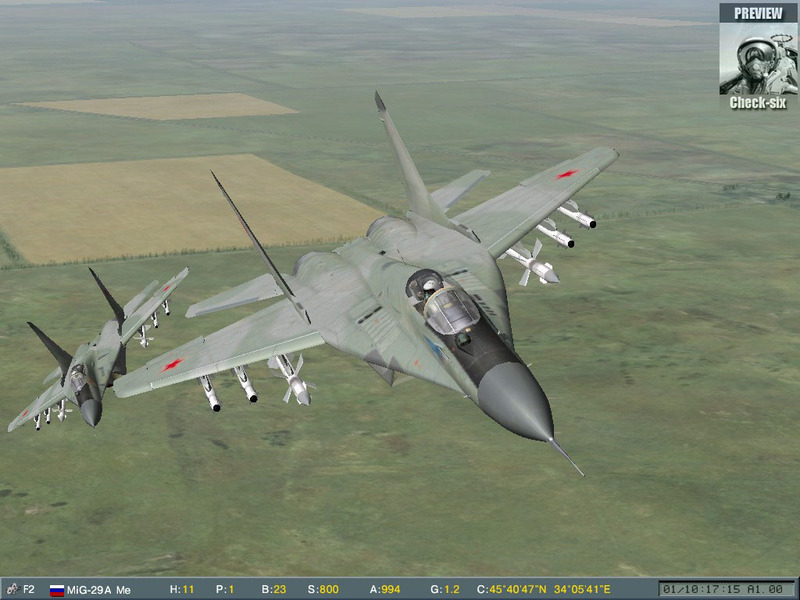 Although directly originated from Flanker2, Lomac is an entirely new simulator. But this does not mean it denies its past : on the contrary ! 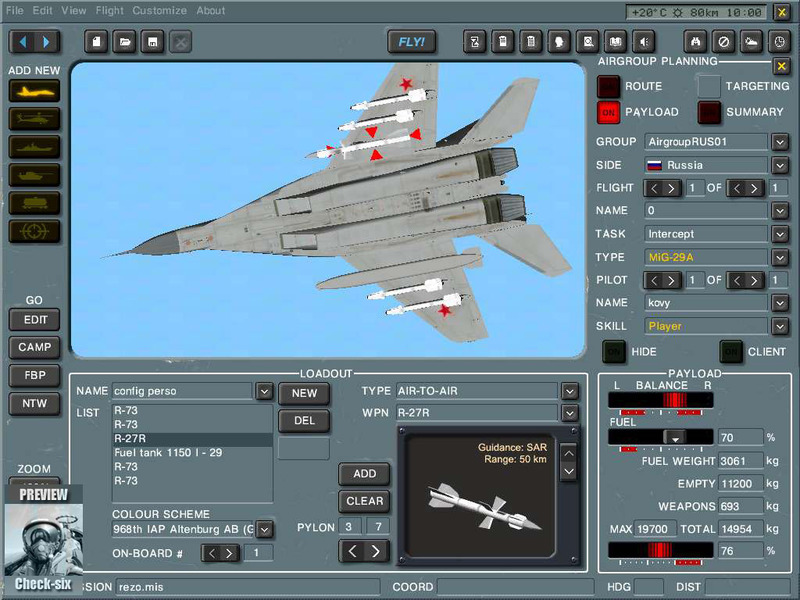 Lock On was built upon the base of Flanker2.51, the latest version of this simulator exclusively dedicated to russian fighters. This was back in 1999 and Eagle Dynamics was working on a follow on, more humble, with only one important novelty : the ability to fly the Su39, a modern version (but only existing as a prototype ) of the Su25 attack fighter. This Lomac's embryon is then called "Flanker Attack !" Soon, the team, led by Matt Wagner, decides to integrate the american A10 in the project. Indeed, Flanker2 sales were not that good in the US, and the A10 seems to be an excellent idea to please the american market. Moreover, Jane's had just cancelled its A10 simulator, leaving "Flanker Attack" without competition for this particular aircraft. After some months and work, the project begins to take shape and the list of the flyable aircraft is finally updated : Su-33, Su-27, MiG-29A, MiG-29C, Su-25, Su-39 for the russian side, F-15C and A-10 for the US side. As for the name of the future simulator, it becomes "Lock-On : Modern Air Combat", or "Lomac" to his friends ;). One year later, the Su-39 is finally dropped back, for lack of time and money. It is true, however, that only two prototypes of this aircraft actually exist, and that its presence in a mid-90s scenario would have been strange. Some time later, the dynamic campaign is officially cancelled, after the developper in charge of it left the project (due to health problems). But enough with bad news ! Let's get some fun now ! 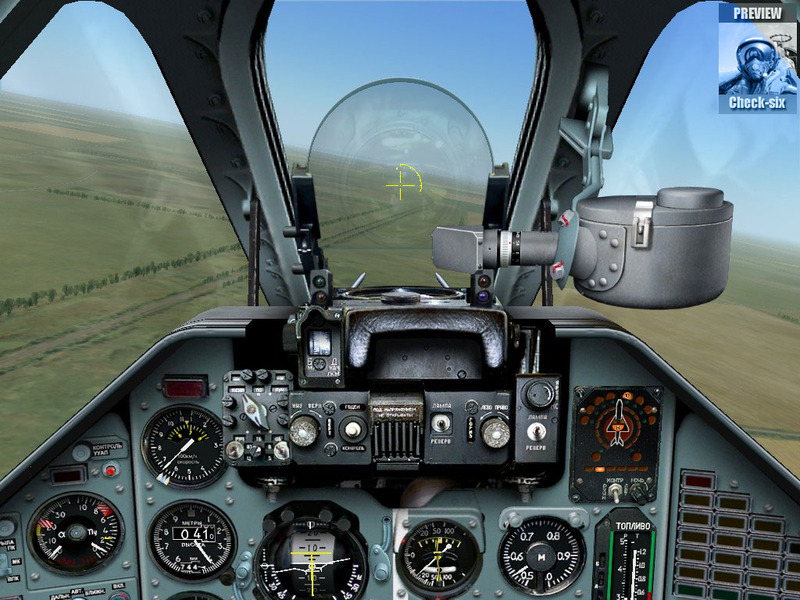 After an installation without problems, you are in front of the main menu, allowing to try immediatley one of the 6 flyable fighters (all MiG29 versions on a unique slot). And you find yourself instantaneously in the cockpit of your favorite jet. 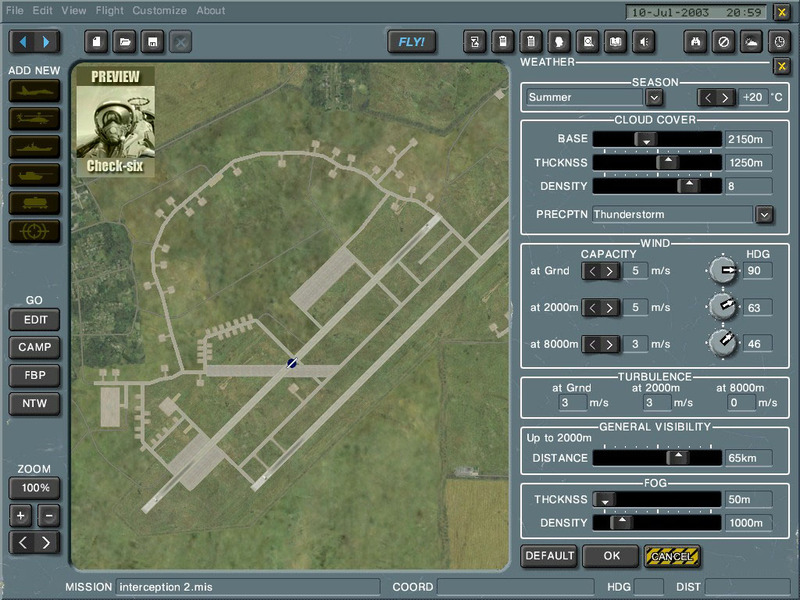 You can also navigate to the training section or create a fast mission with the very handy "battle generator". The later allows to create automatically simple missions in a few seconds, putting yourself directly into action. Eventually, I decide to take a look at the mission editor. After determining the time and the different involved countries (friendly or ennemy), you are brought in front of the theater of operation map, it covers the whole Black Sea, but only the traditionnal Crimea and the Caucasus are modelled with precision. Nonetheless, the detailed area is more than twice that of Flanker2 (including the Caucasus mountain and its breathtaking summits)! The navigation on the map is intuitive : left click/drag to move, mouse wheel to zoom/unzoom and right click to measure a distance ... Perfect! The map is complete, with captions, everything is represented (roads, railways, rivers, towns) : if you zoom enough, every single building is visible. Moreover, it is possible to display terrain elevation contour lines (a mandatory option to create flight plans in moutainous areas) or a "satellite" map, using the sim's textures (very nice, but not very practical). At last, several filters allow to dispaly or hide some elements on the map, for a better readability (and that proves to be usefull for a heavy complex mission !). Now that we are in, let's take a closer look at those meteo parameters ! That's quite complete : external temperature, season (summer or winter), altitude, density and thickness of clouds, precipitations and thunder, wind detailed parameters ... nothing more to say, everything essential is there ! We can just regret that the meteo is global for the whole theater and that you can not create several clouds layers. But, hey, for a combat flight sim, the available options are more than satisfying. Well, let's not waste more time, I am longing to get in the air. 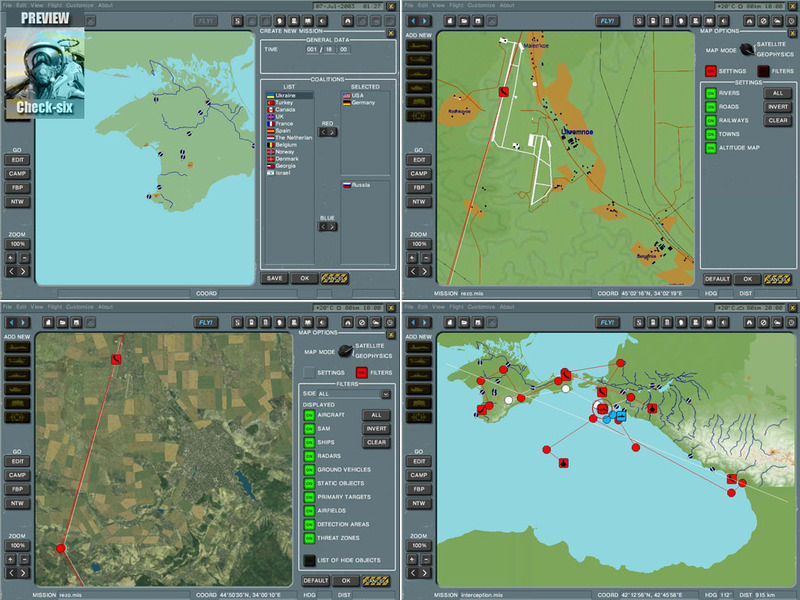 In three mouse clicks I build my flightplan (flankerites will not feel disoriented), I choose my country, aircraft, weapon loadout and camo scheme! 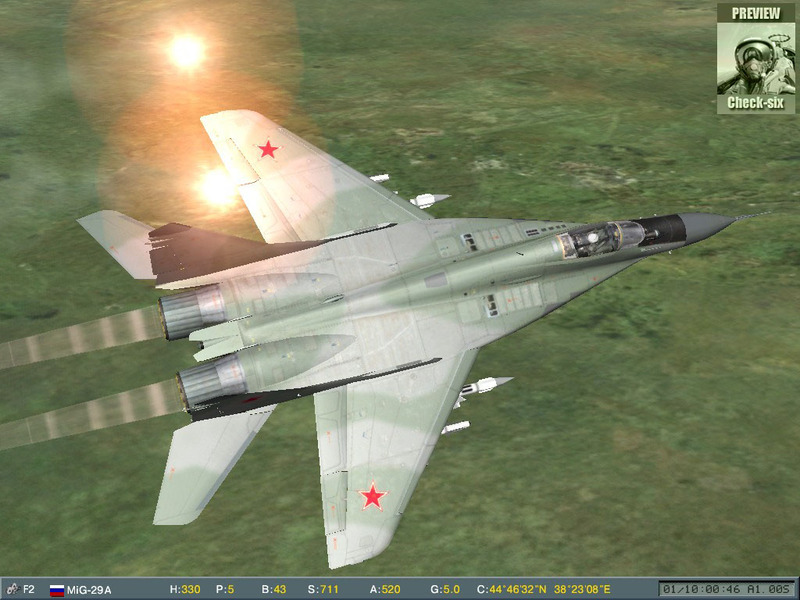 After some hesitation, I'll fly my first solo in the russian MiG29 Fulcrum A. The loadout editor is exemplary and only deserves praises. Besides the loadouts, already predefined depending on sortie types, you can create your own loadouts and save them for future use. The editor even warns you about the centring of your aircraft for disymetrical configuration, as can be seen on the screenshot. OK, everything is ready ! A click on the "Fly" button and the loading screen appears. After a few seconds, I'm in cockpit ... and what a cockpit ! How can I describe it ? It is ... real ! I look at it ... and look again, and I can't find any defect, this is a true work of art ! And yet, I know well the MiG cockpit ! A quick look at my personnal documentation about the beast leaves no doubt ... Everything is good, the perspective and proportions are exact, every switch is at its right position, the HUD symbology is superb. A little zoom on the consoles reveal cyrillic inscriptions perfectly readable (for those who speak Russian). 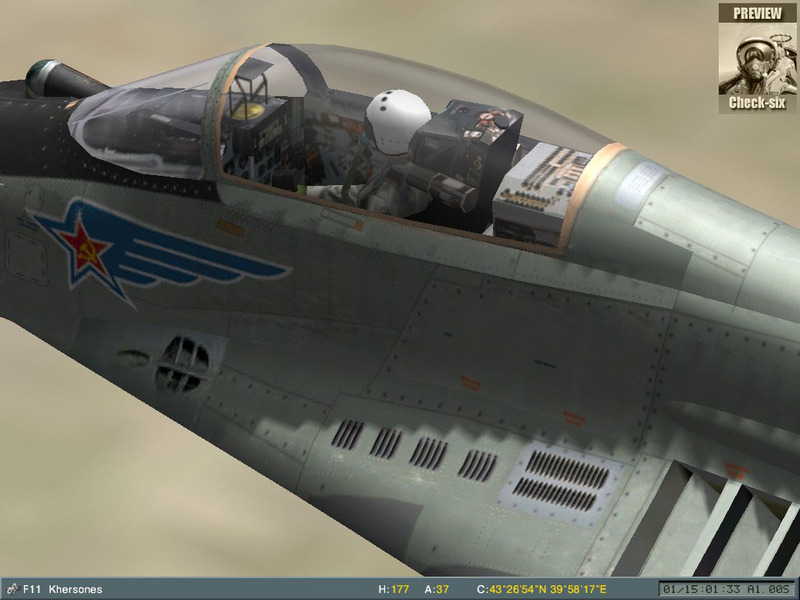 Throttle and stick are completely modelled in 3D, like in Flanker2, but with an extreme attention to details. Notice on the screenshot the throttle splitting in two parts... Indeed, Lomac can handle the two engines independantly. As I specified in the editor that i wanted to start from parking position, my MiG is waiting quietly, engines off, on the tarmac. I ask the tower the authorization to taxi and the controller tells me which runway to get to. I push slightly the throttle and the MiG starts to move, waddling on its front gear, whose suspension is greatly rendered. While waiting to rejoin the runway threshold, I open the canopy to get some fresh air. Immediately, the engine noise becomes deafening and I have to close the canopy to find some quietness ! Once on the runway, I apply full ground brakes, check my aerodynamic control surfaces, nav lights on, flaps out and I ask the tower the clearance to take off. Clearance granted, throttle to max military power then full after burner. The thrust is so big the Mig moves despite the brakes. Brakes off, and my aircraft springs up. In a few seconds I reach rotation speed. Landing gear in, then flaps. Speed and altitude rise fast. The landscape, from above, is even more beautifull ! The atmospheric veil of mist is astounding. The flight feelings are really unbelievable ... even more than in Flanker 2, which was yet a reference ! The landscape looks very realistic and flying in a steep relief area is really exciting. The trees density and the ground textures resolution give a true sense of speed while flying at low altitude. To cancel the pop-up effect of ground object (sudden apparition of the objects when in visibility range), Lock-On uses a rather efficient fading system. 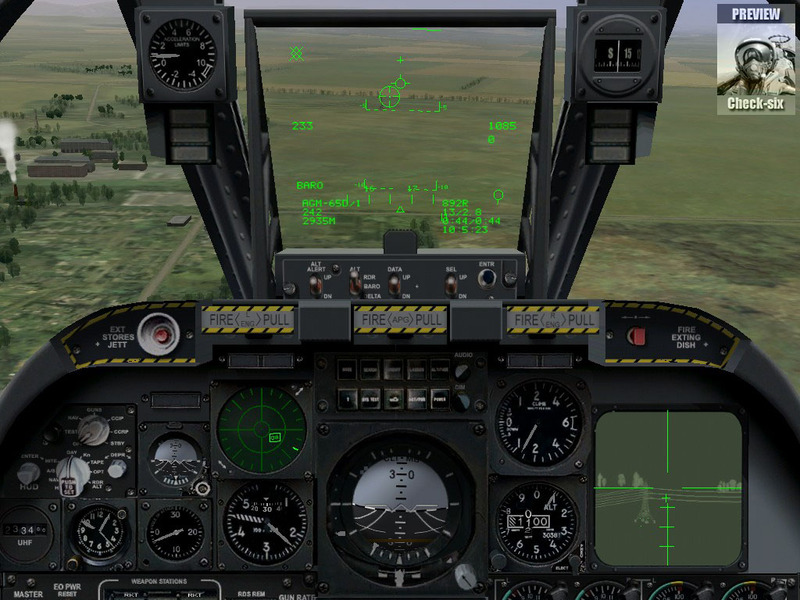 Even though it might seem strange on a still screenshot, this is in fact quite efficient while in flight. The MiG flight model is very healthy, even though it's difficult for us to judge objectively this aspect of a simulator. The aircraft accelerates very fast, and is particularly manoeuvrable. But you have to handle the stick with care to keep inside the flight envelope. Indeed, as soon as you pull the stick hard, the AOA rises monstruously and you will lose control if you maintain such a manoeuver too long. This all promises fierce and very technical dogfights, where you'll have to keep an eye on the G and AOA dial. Another characteristic of the MiG29 : its high fuel burn rate ! Without additional tanks, you'll have to use the afterburner very wisely, if you don't want to run out of fuel after a 20 minutes flight... The journey back to home base will be flown with instruments, with the help of the HSI or the lateral MFD. We find here again an unrealistic feature unherited from Flanker2 (indeed, the MFD is supposed to be only a HUD repetitive device in reality). When beginning the approach circuit, the tower warns you about the possible other flights in the proximity, and leads you if you ask for landing clearance. On final, the ILS turns on automatically if you are in the appropriate navigation mode. During the whole descent, the controller notifies your position with respect to the ideal glide plane. This is a neat detail which can proves usefull in case of HUD failure ! I touch down at 330 kph, a speed advised if you want to keep a reasonnable AOA and a good visibility on the runway. 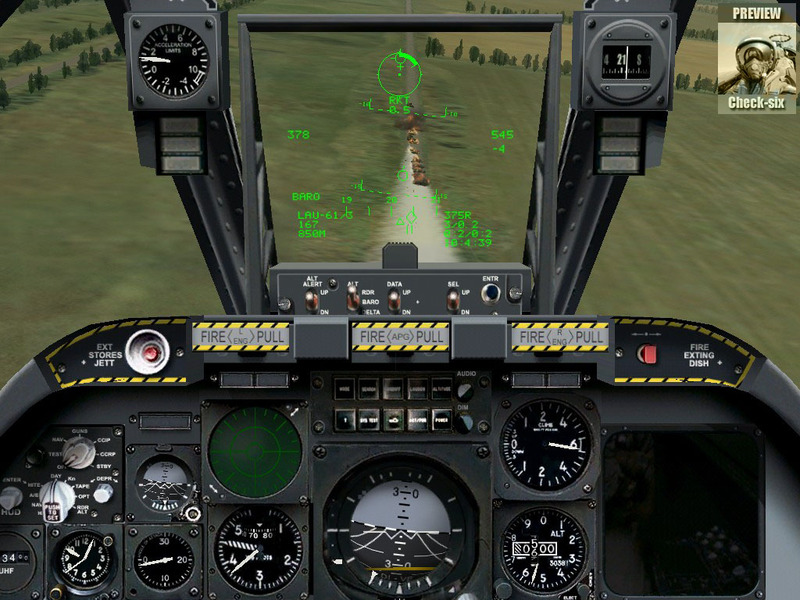 I deploy the drag chute and decelerate slowly till the complete stop of my aircraft. After a few seconds, the tower reminds me to leave the runway, which I do in order not to disturb the traffic ! Once on the tarmac, engines off and canopy open, the first thing you want to do ... is to go back and do it again ! The artificial intelligence has achieved significant progress since its flanker 2 state. Compared to its predecessor, the moves are greatly enhanced and the avoidance manoeuvers are quite complex. 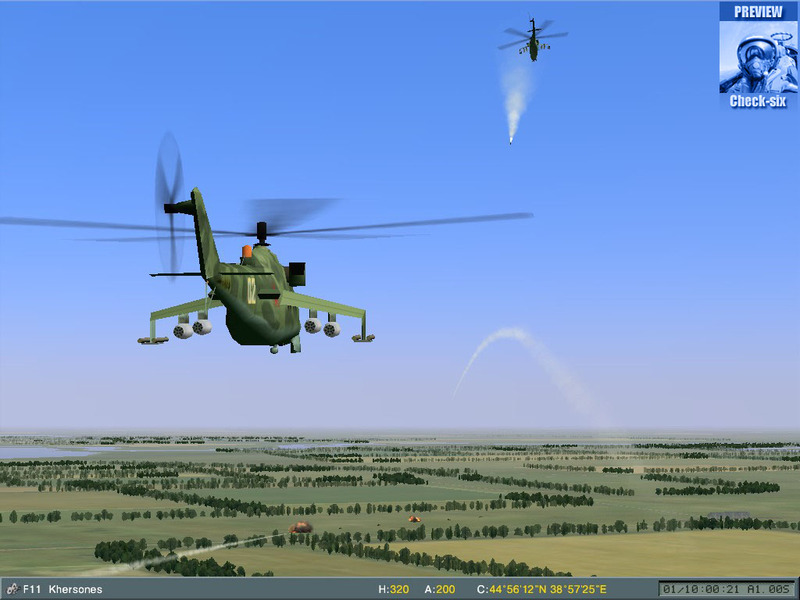 The war on the ground, nearly non existing before in Flanker2.x, has notably developped : vehicles' moves are programable as you wish, the fights between two forces are more or less automatic, and targets mistakes as well as collateral damages do happen sometimes. The different weapons are well used and their respective ranges are reproduced. So, a T-80 will engage after getting a visual on his target while a self propelled Howitzer (such as the american M-109 for instance) will shell at a greater range (moreover, the efficiency of these two systems is quite different). Ground vehicles can follow roads, or drive across fields, change their formation or station in order to defend a strategical position (such as a bridge for instance). Tanks can use their machine guns at short range, and infantry fighting vehicles (such as BMP-3 or Bradley) have the capacity to fire anti-tanks missiles. Above the sea, ships use all their on board systems (surface-to-ground, surface-to-air and surface-to-surface) and you can assign them objectives of different kind. If ennemy aircrafts and ships are engaged automatically, you can also assign them ground targets. So, a Ticonderga class warship can destroy any ground building with its BGM-109 Tomahawk cruise missiles. 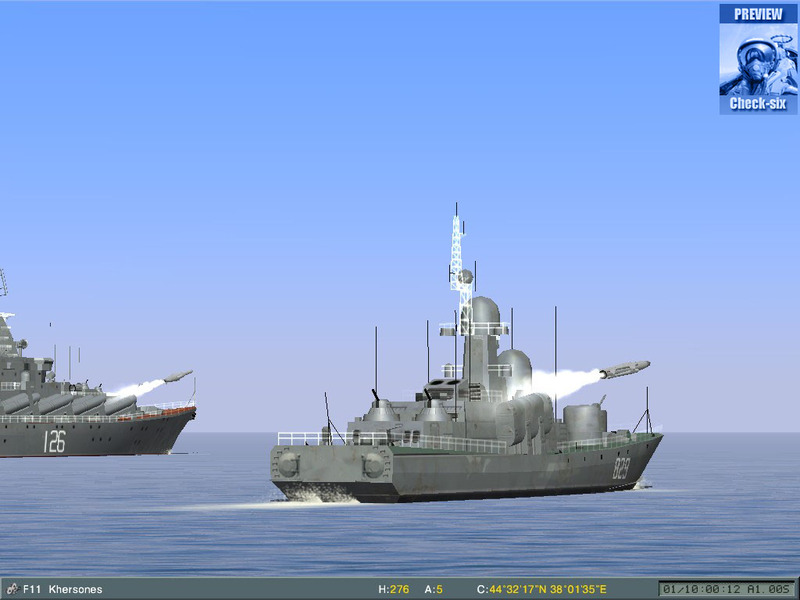 The respective range of the different surface-to-air, surface-to-surface and surface-to-ground missiles is modelled. The detection and track range of the surface radars are specific to each ship and its weapon system. On top of that, ship based helo (SH-60, Seaking, Ka-27) can now indeed be based aboard frigates and cruisers, fitted with an appropriate landing platform. Concerning the CH-53, it can be based on an aircraft carrier. With such an equipment, warships in Lomac are fearsome weapon systems, whose firepower shall not be underestimated! Concerning weapons, most of the american and russian arsenal is modelled in Lomac. To which you can add the bombs and missiles used by the aircrafts, ships and vehicles of some other countries ( and notably United Kingdom, France and Germany). Of course, all their characteristics are reproduced quite well, and each aircratf, ship or vehicle can only be fitted with weapons used in reality. But don't panic, the encyclopaedia will allow you to get soon familiarized with the whole missiles, rockets, laser or TV guided, free fall, incendiary, anti-runway or retarded bombs. Now, let's get to what concerns us a little more : aviation ! The artificial intelligence is quite advanced and the tactics executed in the missions we can design are very credible. 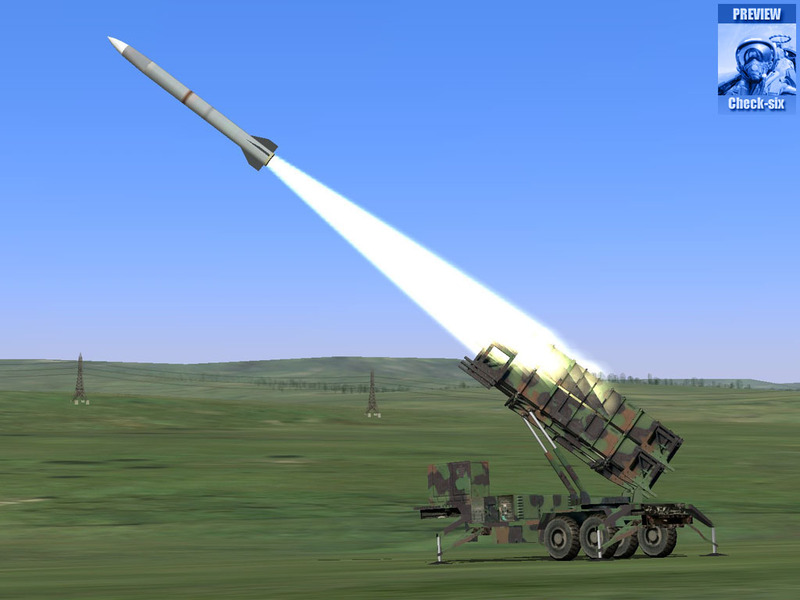 In SEAD missions, AI knows how to titillate the radars, to make the SAM fire and let their missiles get lost without hitting their targets. Besides, AI establishes priorities for its targets in the air or on the ground : A-10 will first engage shilkas and other AAA when attacking a convoy, leaving the other, less dangerous, vehicles temporarily aside. For each mission type, each ammunition, AI has an appropriate engagement profile : AI will not bomb the same way with antirunway bombs than with laser guided bombs (with the russian way : while diving). A-10 attacks are rather spectacular and realistic, when compared to videos. 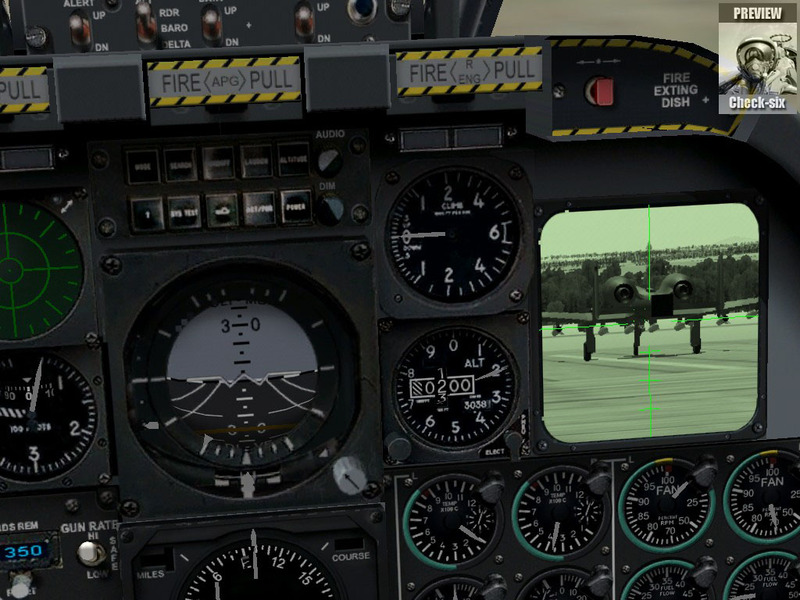 The A-10 will perform a steep dive, fire a short burst with its avenger and climb back to an observation altitude. Enough with the air-to-ground stuff, now let's go the serious business ;). Joke aside, this is the time for the air-to-air battles... For training purpose, you can fight fierce TigerII or F16 from the "Aggressor" squadron. You'll then be able to compare those two different generation fighters and their respective manoeuvrability. Dogfighting is a real challenge ! 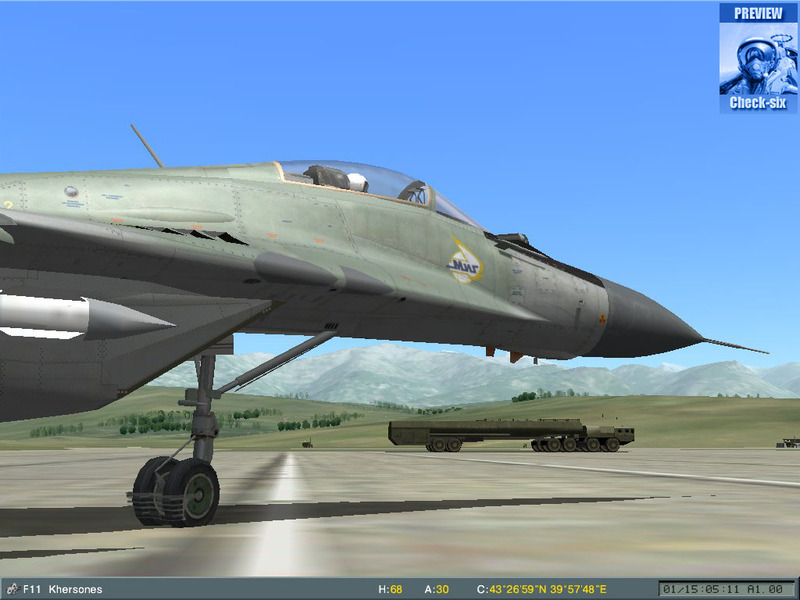 On the american side, you can fight with your F-15 against very different aircrafts, such as the MiG-23 or the Su-22, whose avionic is quite old, or face the very modern Su-34. 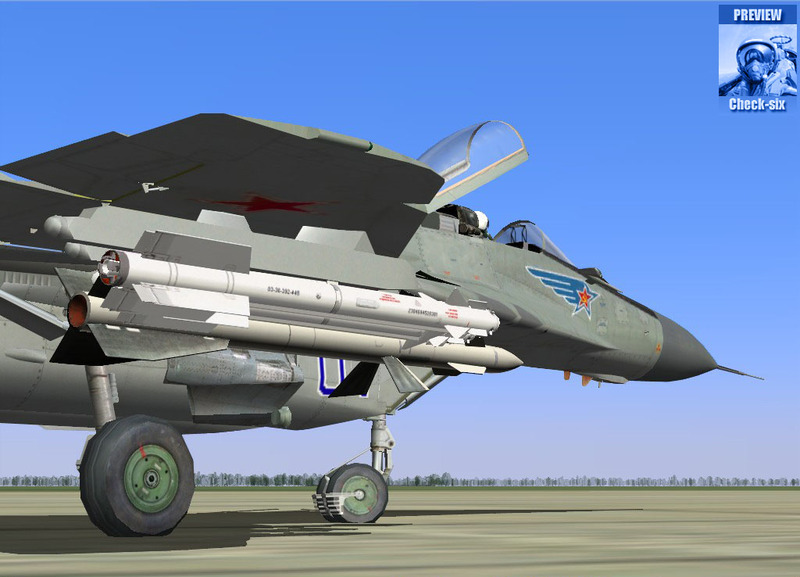 Naturally, you'll check your BVR abilities against the MiG-31, fitted with its redoutable R-37, a long range active missile, the russian equivalent of the Phoenix. If these aircrafts have unquestionable flight characteristics, some others may appear as good surprise, such as our national Mirage 2000-5, quite elusive during combat. You'll fight untill you run out of fuel or you'll eject before ... only the best will survive in dogfights ! Each AI, on the ground, on the sea or in the air, can be assigned different difficulty levels, either a fixed one or a random one, which will give some more spice to your missions. AI objects are handled individually and thus require lots of CPU resources. That's why you'll have to accept a reasonnable number of AI in the missions if you don't want to put your PC to his knees : stop dreaming about a Falcon 4 scenario with hundreds of active units, statistically handled outside of the palyer's bubble. Now, let's talk about the most awaited topic : avionics. This topic is very hot and should be dealt with caution and without prejudice. That's why we prefer to wait for the final version to be more complete on the topic (notably concerning the F15 avionics). But, needless to beat about the bush, Lock On avionics won't reach Falcon 4 SPx standards... you're warned! Which does not mean that Lomac's avionics, for each aspect it's kind enough to simulate, is less realistic. 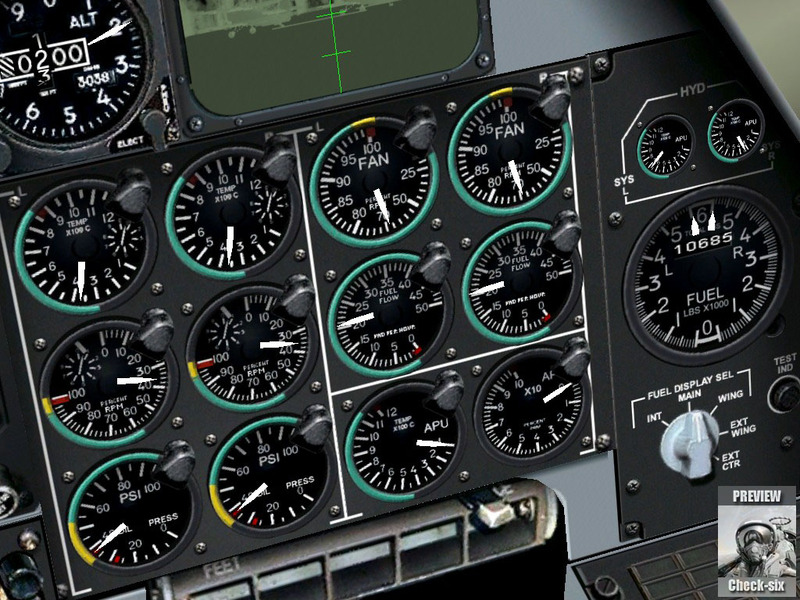 The main navigation and combat modes are accurately modelled, and the symbology of HUD modes is near to perfection for all the aircrafts, which are very different, let's not forget. Also, keep in mind that flyable aircrafts have single role weapons systems, and thus these systems are less dense that what can be found on a last generation F16C for instance. For this first approach, we will deal with the A-10. With my distant experience with "A-10 Cuba", I find myself in a familiar cockpit! It is completely like the real one. 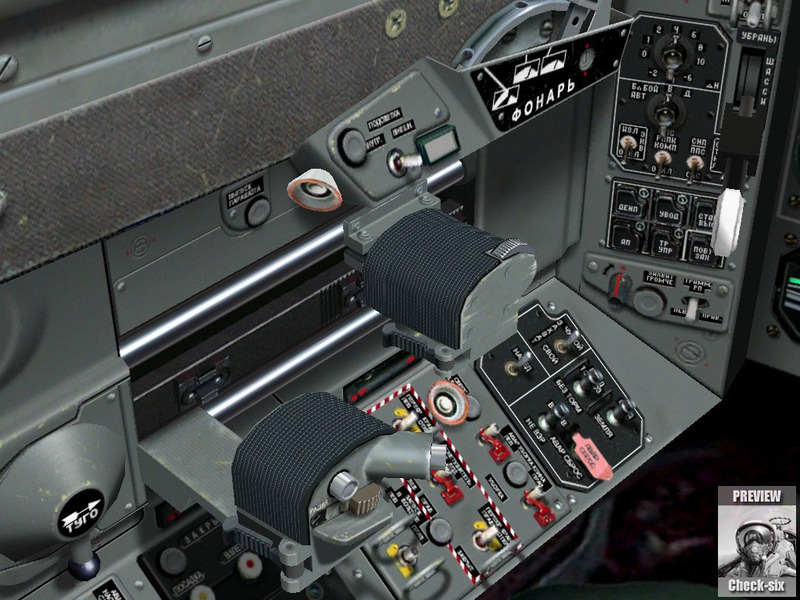 Unfortunately, it's not clickable (none of the other cockpits in Lomac are) and most of the switches are not animated, with the exception of the Master ARM and the gun rate switch, which are animated via the appropriate key strokes. Another good news, about the weapon station panel : the firing mode selector (single, pair, ripple single, or ripple pairs ) and the release interval and quantity settings are active and can be set to your desire. In navigation mode, as in air-to-ground mode, the inertial central feeds all the data on the HUD ( # waypoint, heading, distance left to travel etc ), but you can also use the HSI (Horizontal Situation Indicator). The A-10 is typical of an aircraft with simple (but not simplistic) avionics. Without any radar, you mainly have to engage with a visual on your target. For the air-to-ground attack, you have the CCIP firing control system for bombs, and an impact reticle with distance information for the use of rockets and gun. The comparison with videos confirms the HUD symbology seems correct. - On the HUD, lock the missile reticle on the area of search. This enables the stabilization of the maverick seeker, on azimute and site axis. - Search for the target on the TVM, by slewing the seeker. When in range, the system displays little brackets on the designated target (if a target is in the area). - Then you confirm your lock and you can fire. The TVM does not dispaly any data, which seems to reproduce correctly the real one. You can see on the screenshot the ability to check the system conditions on ground objects! However, the maverick reticle on the HUD lacks the information distance... A strange lack, as this information is there for CCIP reticles. Moreover, the air-to-ground modes handling is simplified, since the change from the electro-optical mode (for the maverick) to CCIP modes (for bombs, rockets and gun) is performed automatically when you activate the appropriate weapon. Another lack : the impossibility to use the gun simulaneously with the electro-optical mode. Nevertheless, the analogical avionics are entirely functional and very accurate: ADI, HSI, compass, accelerometer, altimeter, airspeed indicator, variometer, clock, engine rpm (including for the APU), temperature, oil pressure, instant fuel flow… In short, everything needed to have fun in a foggy weather! On the Russian side, everything we knew from Flanker 2 is back, except the most fanciful aspects of the avionics such as the strange air-to-ground radar, for instance. 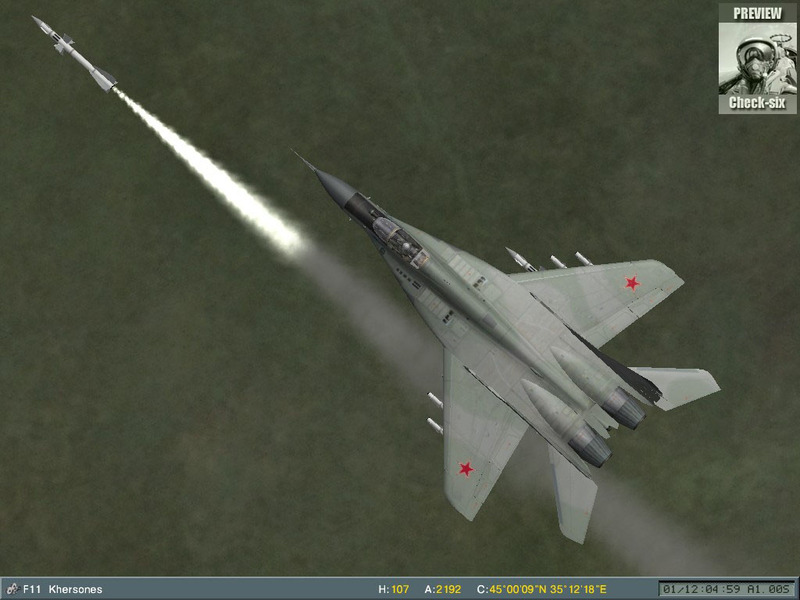 The CCIP-like targeting system has also been removed from the Su-27. We can add that the HUD symbology has been lightly modified in order to be more realistic. Some previously ornamental-only gauges are now fully functional in our so beautiful new cockpits. Now about the radars, the performances seem to have been quite lowered comparing to Flanker 2. 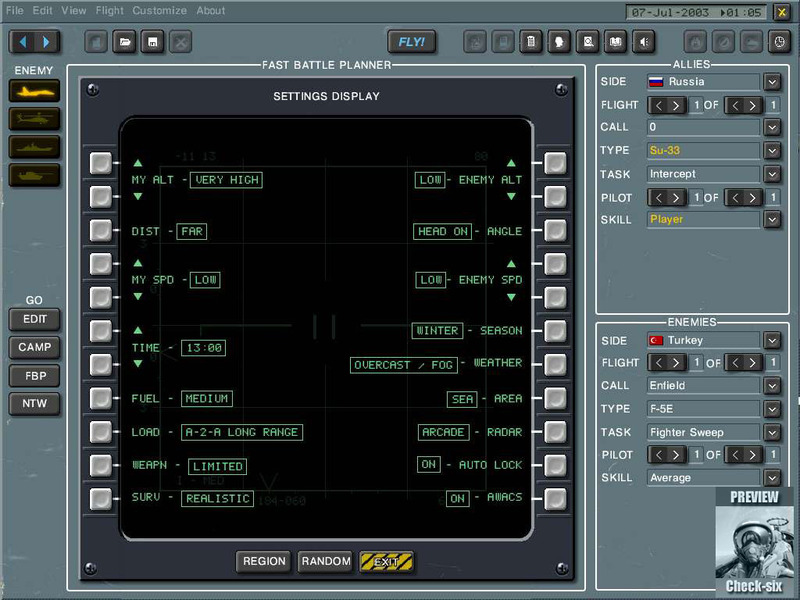 A BVR engagement in a MiG-29A will be really a challenge (a little glass of vodka before the fight won't be one too much in front of a F-15C), particularly because of the outstanding progress made in the electro-magnetic environment aspect of the sim since Flanker 2. We will also happily notice that the German MiG-29A's avionics are specific, along with a Nadia who will speak to you in the language of Goethe… Charming! The Frogfoot's cockpit is entirely analogical, so there is not much to say about its avionics, except that it is at the same level than the other ones' for the "clockwork" part of it. As in real, you will have to fight with a lonely gunsight that will anyway allow you to designate targets with your laser sight (fot the Kh25ML) or the ARM's seekers (Kh25MP and Kh58). 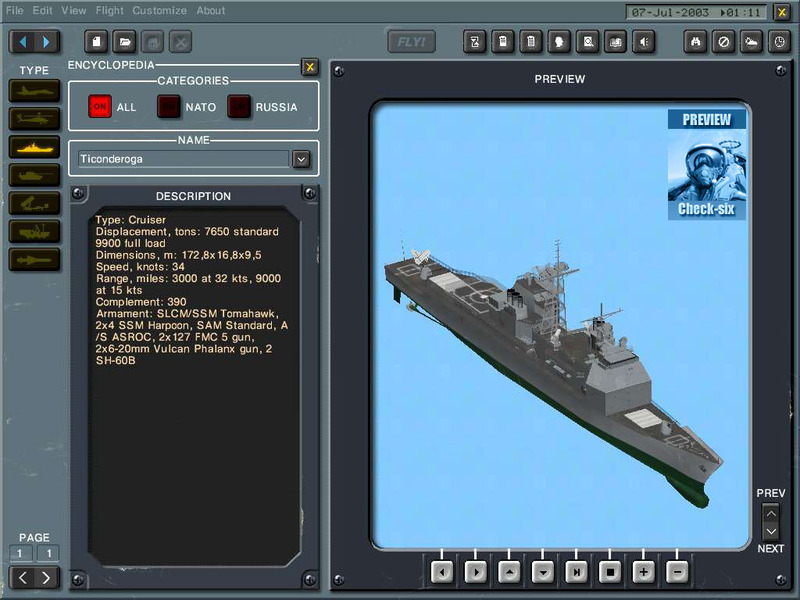 The whole difficulty of the laser guidance consists in achieving a firing pass within the parameters of the missile and the laser designator (you'll need to dive to the target). One of Lock-on's strong points seems to be, as we already said it, the new managing of the electro-magnetic environment. It's true that it is usually a part very basically reproduced in the jetfighter simulations, and that was the case with Flanker 2. Radars and counter-measures were particularly re-worked: the ECM can really break a lock, and your radar will have much difficulties in acquiring a target flying lower than you because of the ground interferences. Flares and chaff have a true efficiency when they are combined with manoeuvres such as beaming. It's not all: your counter-measures may even get a danger for yourself against a F-15C which would use its amraam with the HOJ (Homing On Jam) firing mode. 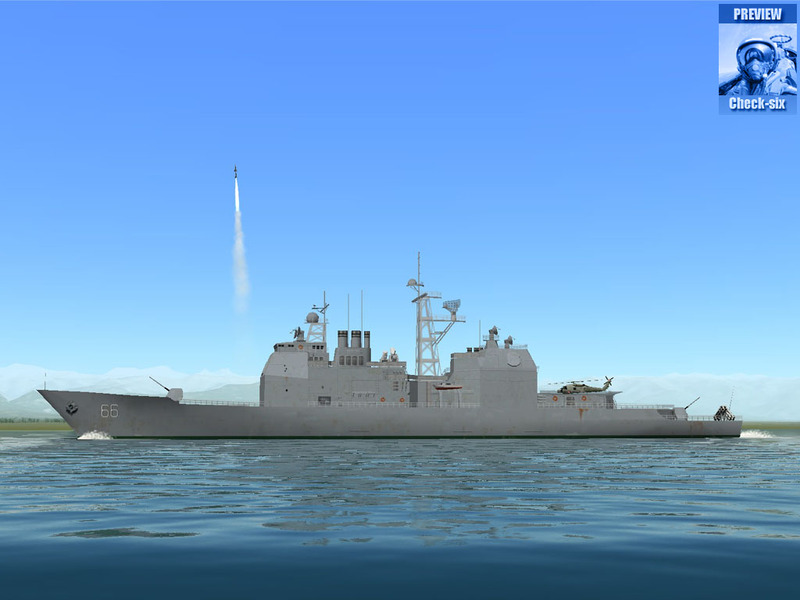 This new mode allows the US pilot to fire a missile which will home especially to the source of the jamming… Diabolic! This is certainly one of Lock-On's finest aspects: the ability to confront very different weapon systems, requiring fully opposed tactics in a rather credible electromagnetic environment. The first feeling Lomac gives you is very, very positive. 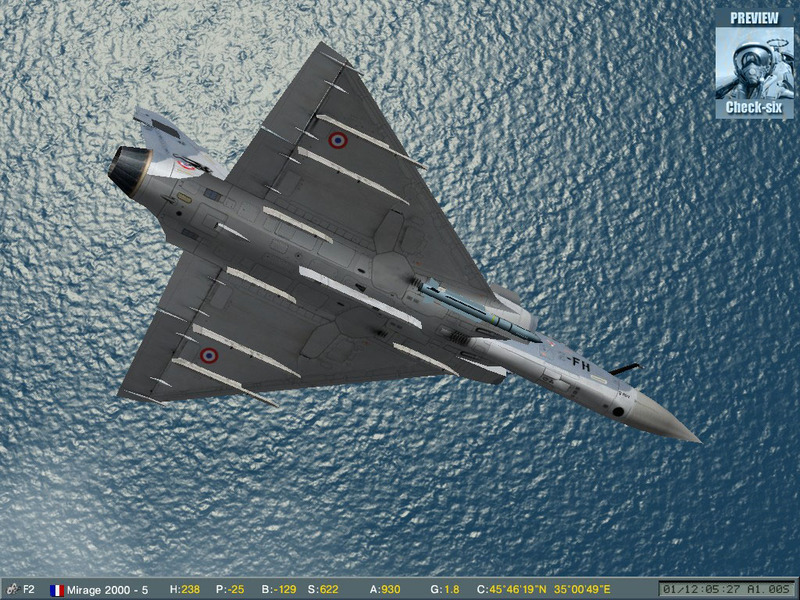 Lomac is a big step forward when we take a look at the numerous improvements over its ancestor, even if we would have loved to get even more avionics improvements (but was it something possible, with four completely different planes to simulate?). Falcon 4 addicts will probably get a little frustrated, but I'm sure they will eventually find their own pleasure playing the beast. The sound and visual environment have achieved giant steps since Flanker 2: communications now deserve to be called this way, and the multiplayer mode looks promising. Of course, you will need a powerful computer to enjoy every graphical setting: plan to acquire a big graphic card and much, much RAM in order to push the graphical slider to the higher setting. Yet, it is still too early to have a complete and definitive judgement and we do prefer to come back on this point later in our review, or when the demo will be released. Keep in mind that his preview was realised using a pre-beta version… Many functionalities were still at the workshop or not available. Nevertheless, Lock-on still looks to me very promising and will be a brilliant heir of both Flanker 1 and 2! 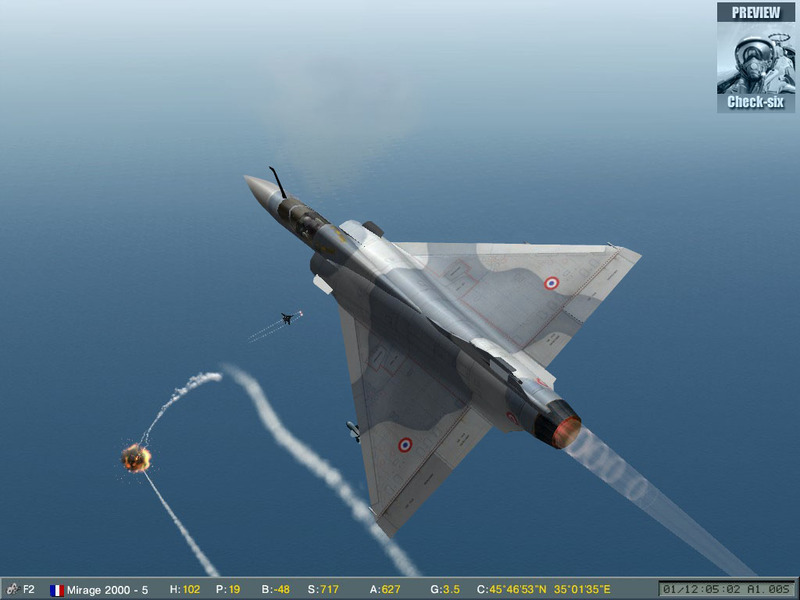 A Mirage 2000-5 hunting a MiG-29 (notice the Magic 2 which explodes in the flares). 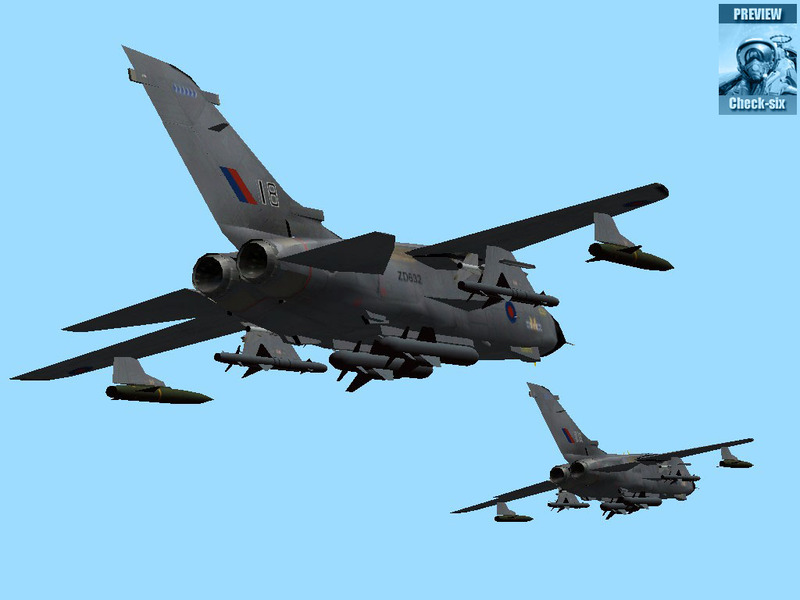 Two British Panavia Tornado in SEAD (Suppression of Enemy Air Defences) mission. A weather not to put a Hercules outside! 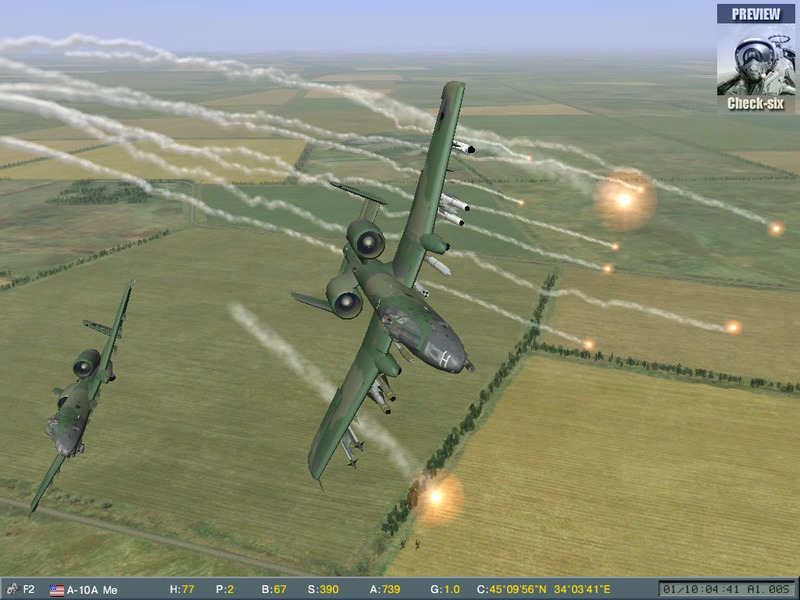 Big bunch of flares for this A-10 in CAS (Close Air Support) mission. 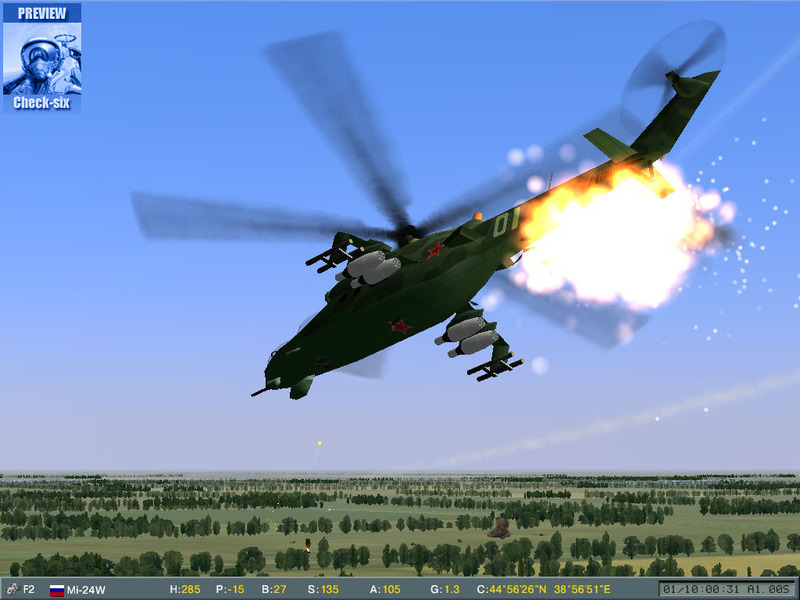 It's already too late for this Mi-24, Avenger 30mm shells are sending him to the ground! A Patriot battery: something you should not approach if you have a red star on your plane…Better stay away from this deadlyl-beating snake! Same thing for the Ticonderoga, which will not show much more mercy! Notice the SH-60 which is taking off from the rear platform!